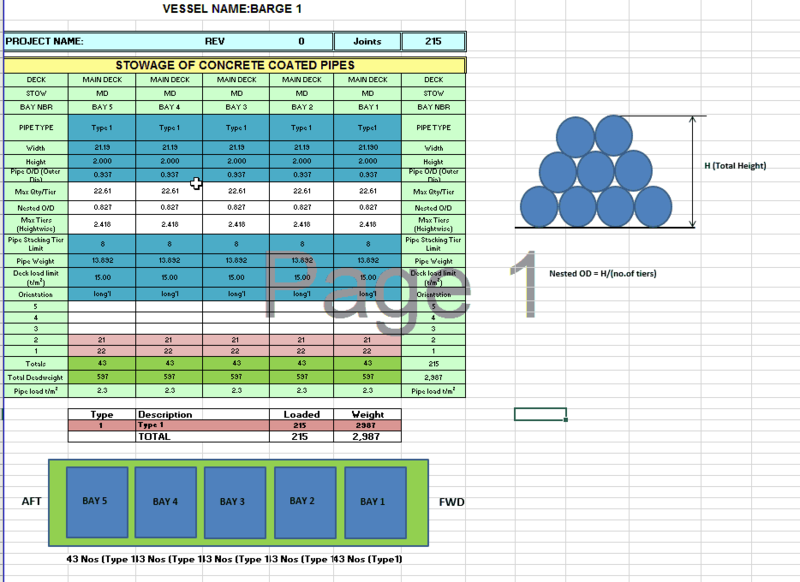 In this part we will see how we can estimate the maximum safe towing speed for the vessel to ply in a given sea state. 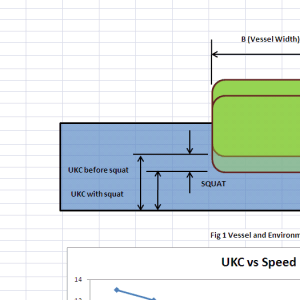 Before we get to the actual methodology, let’s look at the concept of Available Pull of the tug at non-zero speed. At zero speed, Ftug is zero, and whole BPmax is available for the holding the towed vessel. 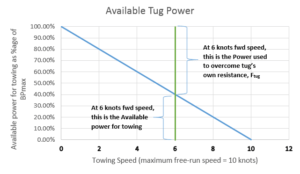 At the maximum free-running speed of the tug, the whole BPmax is utilized for the tug’s own resistance, and the available power for towing is zero. Thus, if we plot the available towing power of the tug vs speed, we will get a curve like below. The actual curve is not exactly a straight line, but we will assume a straight line to keep things simple (it also leads to more conservative results). Second, the environment under which towing is performed is not the same as the STALL environment scenario. Usually, the STALL sea state is a harsher one in which the requirement is to HOLD the tow, and not move it forward. The towing will be done is a comparatively milder environment. 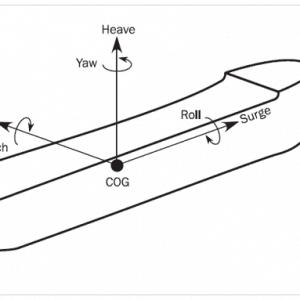 Our objective is to find out the maximum speed which the tug can make in a given environment. Step 5 – Plot the curve of Total Environmental force (FTOT) vs towing speed on the same graph as the tug performance curve. The environmental parameters for towing in this case are the maximum wind, current and wave in which the towing operator proposes to tow the vessel. 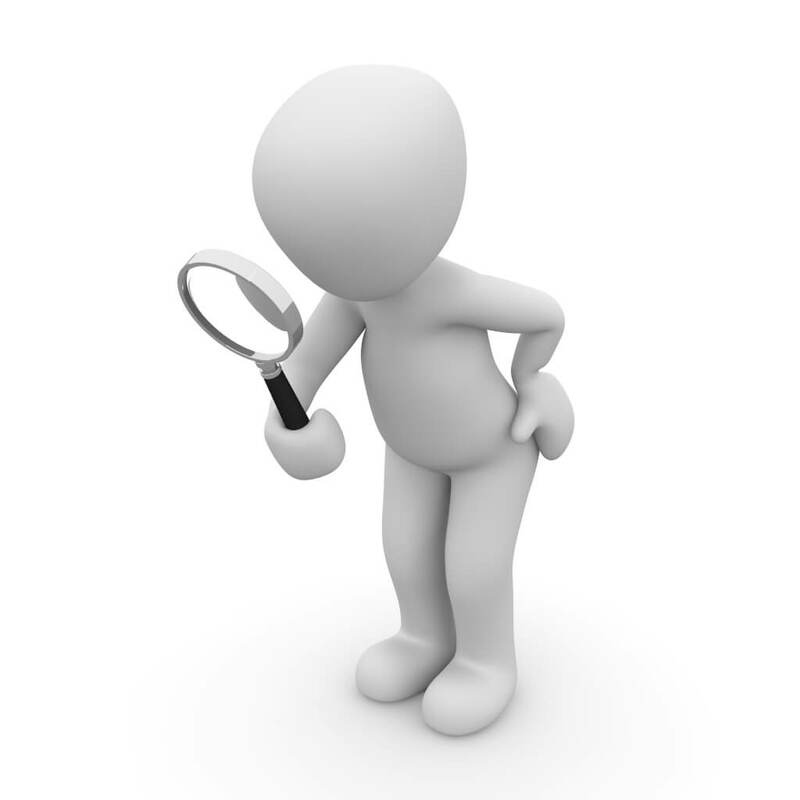 The towing operator has to advise the safe limiting environment in which she/he plans to tow. For example, the operator may decide that a wind of 20 knots, wave of 3 m and current of 1 knots is the limiting environment in which she/he plans to tow the vessel. The operator would like to know the maximum speed she/he can make with this limiting environment. The Bollard Pull of the tug at 100% MCR and 85% MCR. Usually the tug will be operated at 85% MCR. 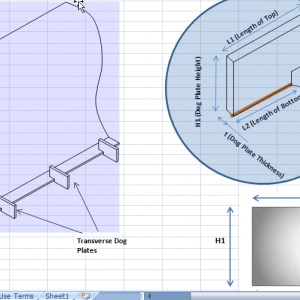 100% MCR is more significant for the STALL condition to calculate the maximum required Bollard Pull. 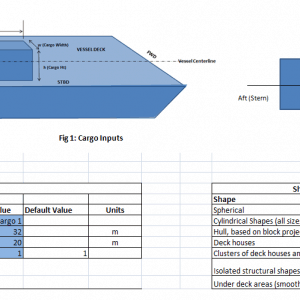 If the tug is operating at some other MCR value, then the Bollard Pull for that value should also be obtained. Once we have the above data, we can plot the tug performance curves for 100% & 85% MCR (or any other value) using the method described in Section 2. 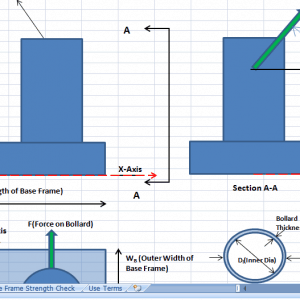 Wind and current forces are calculated using standard formulas described in Part I. 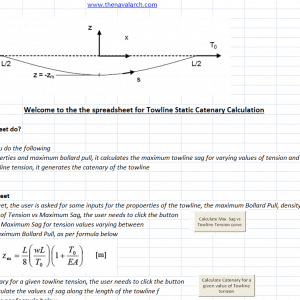 The wave force is calculated based on DNV-RP-H103 Sec 7.2.6. 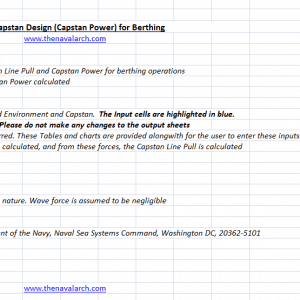 The wave force also increases with the towing speed, and is calculated in accordance with the relevant sections of DNV. Once we have the wind, wave and current forces, we calculate the total environmental force, FTOW by adding them up. 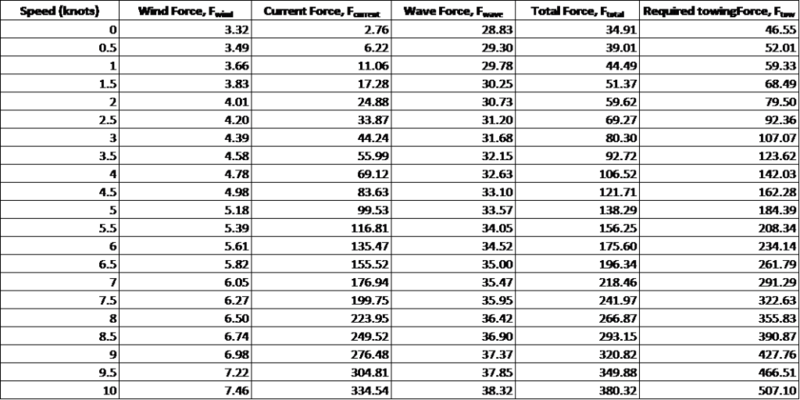 FTOW is calculated for different tow speeds from zero to maximum tug speed. 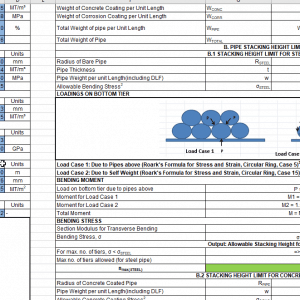 Step 5 – Plot FTOT against tug speed on the same plot as for the tug performance curve. The intersection of the curves for total environmental force and tug performance will give the limiting towing speed. In the above plot, the point ‘X’ is the intersection of the two curves. We can see that at all points to the left of the point ‘X’ (i.e., speeds less than 2.9 knots marked by blue zone), the available towing pull of the tug exceeds the required towing force, thus making the towing feasible. 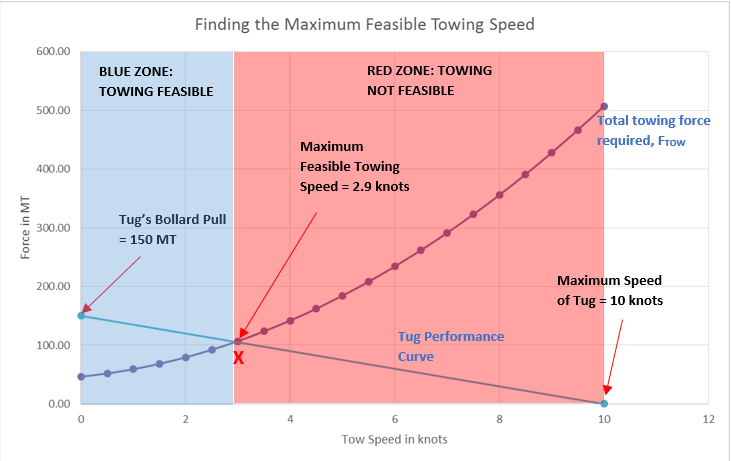 However, to the right of point ‘X’ (the red zone), the available tug power is less than the towing force required and towing is not feasible. 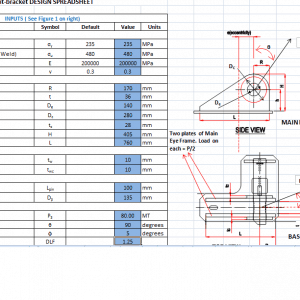 Thus the maximum towing speed feasible for this case is 2.9 knots. 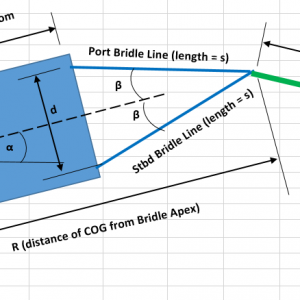 Thus we saw how the maximum feasible towing speed can be calculated for towing a vessel under a given environment. 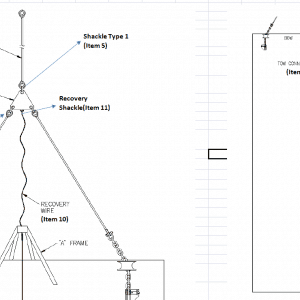 This exercise becomes useful when the Client or MWS requires that a minimum towing speed be achieved and demonstrated through calculations. That brings us to the end of this two-part article on Bollard Pull. We hope it has been useful to our readers. Do let us know your thoughts in the comment section. Happy Towing!! 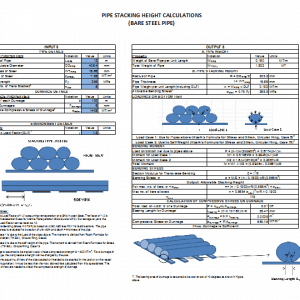 ABS, 2016, Rules for Building and Classing Mobile Offshore Drilling Units, Part 3 Chapter 1,Section 3, ‘Environmental Loadings’, p.11. 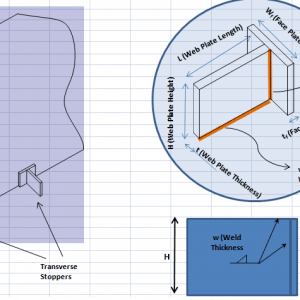 PS: TheNavalArch has its own products for calculating Bollard Pull required for Barges and Ships. Check them out below. Approach may be conservative, but really down to earth for practical use in the maritime towing industry.